Explanation: Why does star KIC 8462852 keep wavering? Nobody knows. A star somewhat similar to our Sun, KIC 8462852 was one of many distant stars being monitored by NASA's robotic Kepler satellite to see if it had planets. Citizen scientists voluntarily co-inspecting the data along with computers found this unusual case where a star's brightness dropped at unexpected times by as much as 20 percent for as long as months -- but then recovered. Common reasons for dimming -- such as eclipses by orbiting planets or stellar companions -- don't match the non-repetitive nature of the dimmings. A currently debated theory is dimming by a cloud of comets or the remnants of a shattered planet, but these would not explain data indicating that the star itself has become slightly dimmer over the past 125 years. Nevertheless, featured here is an artist's illustration of a planet breaking up, drawn to depict NGC 2547-ID8, a different system that shows infrared evidence of such a collision. 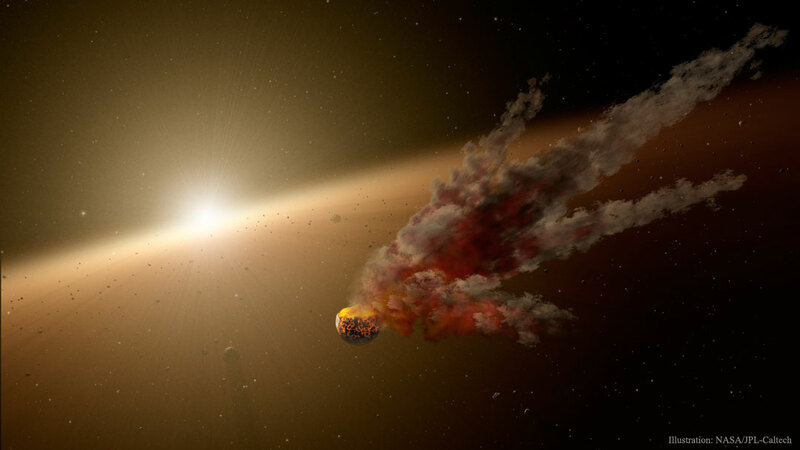 Recent observations of KIC 8462852 did not detect the infrared glow of a closely orbiting dust disk, but gave a hint that the system might have such a disk farther out. Future observations are encouraged and creative origin speculations are sure to continue.